I’ve been so busy recently in preparation to exhibit my work in my first ever wedding fayre at The Wales Millennium Centre in Cardiff Bay. And today was the day it all happened. In all fairness, I was probably more nervous than I was before I walked down the isle on my own wedding day, but the nerves soon wore off after receiving lots of lovely comments from brides and grooms-to-be. It seems that all the late nights and busy weekends were all worth it in the end! I have had a fabulous day meeting lots of excited couples all looking for that something special for their big day – and I was pleased that Baker and Broome delivered on that note. Even my daughter Chloé liked her mummy’s ‘shop’ but seen as it did not have a till, the novelty soon wore off! So after a long, busy day it was nice to come home to a chilled bottle of bubbly which my husband had bought in celebration of a job well done! And of course it had to be drunk in flutes adorning Baker and Broome name tags featured in todays show! Kids in bed, bath run, takeaway ordered. An hour in front in front the box and an early night for me! Today marks a special day on our family calendar. 60 years ago on this day, my lovely grandparents ‘Jack and Babs’ exchanged their wedding vows to each other. My grandad, originally from Merseyside, was carrying out his National Service based in Crickhowell, when he met my nan at a town hall dance in Abergavenny. He asked her for a dance and as they say, the rest is history. To this day, grandad still describes nan as ‘the girl in the candy-striped’ dress’ referring to her outfit on the night they met. So romantic! I have asked them to dig out their wedding invitations for vintage inspiration from 1952! A beautiful bride whose stationery I designed last year had her wedding featured in ‘The Best Scottish Weddings’ magazine (Winter 2011/12). 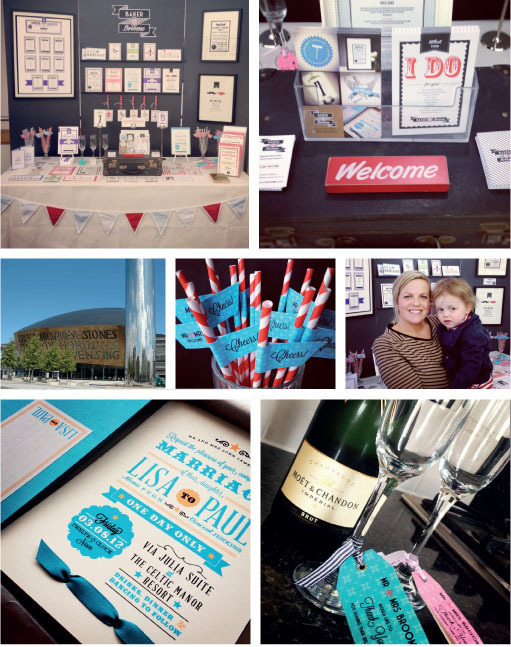 It was lovely to see the newly weds looking so gorgeous on their big day – and it was also lovely to see the stationery featuring so prominently! The invites, RSVPs, table plan, table numbers and place cards were all designed around the couples ‘black and white hollywood glamour’ theme. The suite looked really striking with jet black ink printed onto a diamond white laid stock. The invite card held all the wedding information within three tiered sheets held neatly together with black grosgrain ribbon and was finished off with matching RSVP card and black GF Smith Colorplan envelopes. Thank you for the comment Kyrsti – The pleasure was all mine! I love getting mail through the door with a handwritten address and a first class stamp on the envelope. It makes a nice change from the abundance of junk mail, bills and catalogues that usually appear. Todays mail brought a smile to my face, not only because it was handwritten and contained the Queens profile, but because I knew exactly what it was. My good friends Dave and Louise are getting married this year and yours truly had the pleasure of designing and producing the happy couples wedding stationery. With a colour scheme of deep violet (think Cadburys) and vintage style typography, these simple two sided cards with matching RSVPs and a belly band to hold them together are reminiscent of and old carnival poster. Considering Dave is also a graphic designer – and a very talented one too – I was honoured that he asked me to step up to the mark to design his suite of stationery. And I am pleased to say, they loved the results! Table plan next. I will keep you posted! Oh yes… thanks for the invite guys. We will be there with bells on! …And welcome to the Blog space of ‘Baker and Broome’. Not being entirely sure of what to talk about in my first ever blog, I thought an introduction to myself is probably as good a place to start as anywhere. This is me. Claire (aka Baker) Broome. First and foremost I’m a (probably nagging) wife to Kris, and mother to Chloé and Oliver. But I am also a graphic designer based in Newport, South Wales. I graduated with BA (Hons) in Graphic Design from Blackpool and The Fylde College of Art and Design (part of Lancaster University) in 2001 and have been working in a fab agency in Newport for 10 years. Like many graphic designers whose job is more a way of life than a 9-5 position, I find myself hovering around leaflet stands, buying irrelevant products – just for the packaging, and generally collecting any print-based paper material that makes my heart race and that I can refer back to with great pleasure – like an album of old photographs. Some of my favourite print-based designs are from bespoke stationery products – in particular – wedding invitations and birth announcements. This is probably because they combine two of my favourite pastimes – A huge celebration (of which usually involves a party) and the desire to show off to the world in the form of an amazing piece of print. The thought of producing a beautiful, sometimes quirky, bespoke keepsake for someone – representing their character and containing the details of their biggest moments in life – is a huge honour and responsibility. Outside of my ‘day’ job, I have designed countless stationery products over the years for family and friends (and myself of course), and each comes with a new challenge and level of excitement. I can honestly say that when it came to my own wedding in 2005, I was more excited about designing my stationery than choosing my wedding dress! The Baker and Broome blog is a chance for me to show off some of my own designs, but also to share my interests, inspiration, passions, and who knows what else, to whoever wants to know! I’d love to hear your comments on future posts, and I hope you enjoy what I have to say!